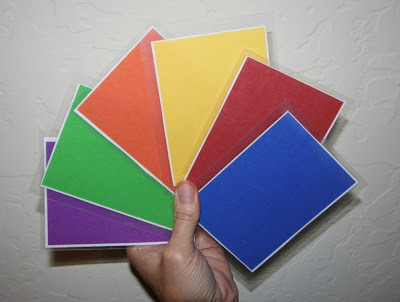 Once you have adhered the colors to the keys on your keyboard, create 3 X 5 inch cards that coordinate with the keyboard colors. I printed mine on regular paper, cut them out in 3 X 5 inch rectangles and laminated each card so it would last longer. 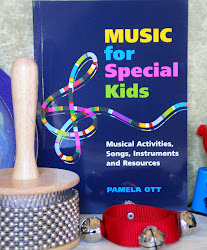 Depending on the attention span and interest level of your child, choose 1-5 cards and arrange them on the music stand of your keyboard. Point to the first color and ask the child to play the corresponding color on the keyboard. Once mastered, change the order and number of colors until the child is proficient at matching the colors. 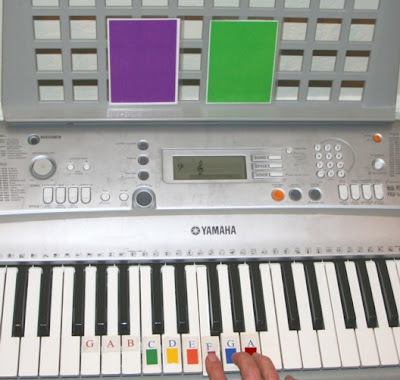 If they are able, begin to have them point to the colored card on the music stand with the left hand and play the color on the keyboard with the right. In preparation of playing full songs on the keyboard, encourage the child to use open fingers and lay them on the keyboard (shown above)instead of curling the other fingers under the hand.